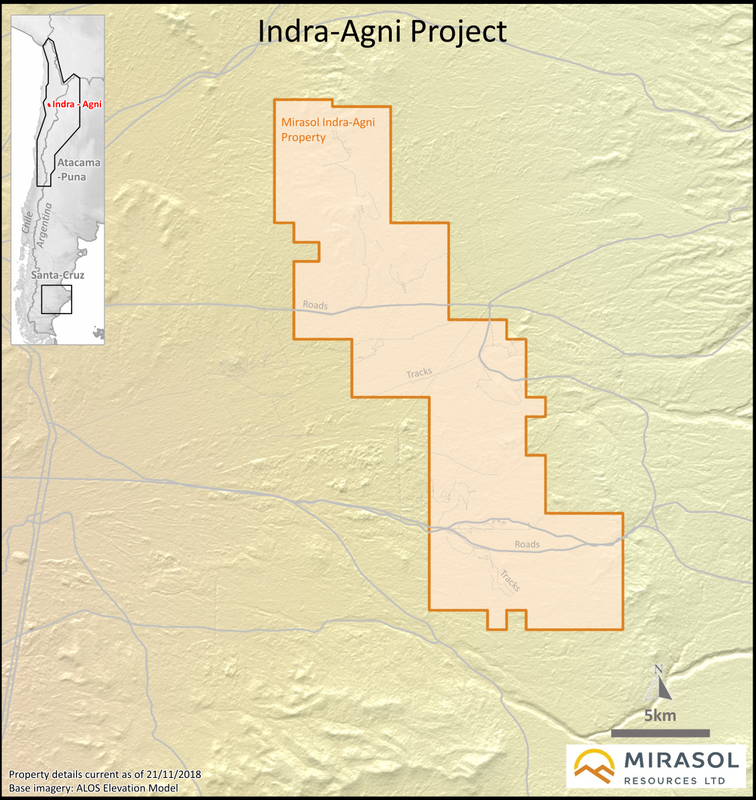 The Indra project was staked by Mirasol as an outcome of the Company’s Atacama – Puna Generative exploration program in 2016 and encompasses what Mirasol interprets may be the upper levels of a large Intermediate Sulfidation epithermal precious metal system. 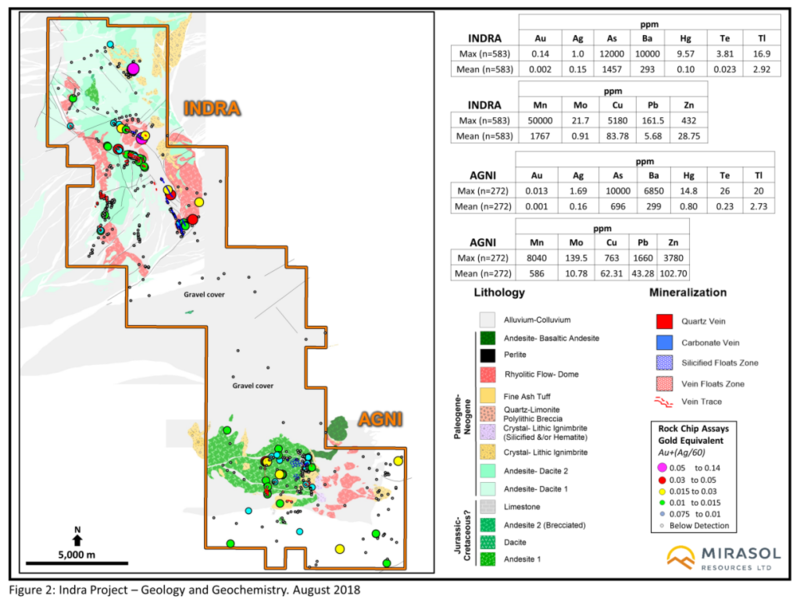 Mirasol has identified a limited number of prospect pits at Indra estimated to be from the 1900’s; however, there is no evidence of modern systematic exploration at the project despite year-round access and its location adjacent to an operating mine. The Indra project is located in Paleocene Age Mineral Belt of northern Chile. The Belt hosts a number of world class mines including Yamana Gold’s El Peñon Low Sulfidation Epithermal gold-silver mine (6.95 Moz Au and 188.1 Moz Ag), and BHP Billiton’s Spence porphyry-copper mine (14 Mt of Cu). The Company announced on October 17, 2018, the signing of a Letter Agreement for an option to Joint Venture with Hochschild Mining plc (LON:HOC) which grants HOC the option to earn up to 75% of the project. HOC can elect to make a series of exploration and development investments at the project, make staged cash payments to Mirasol of US$725,000 and at Mirasol’s request provide production financing for the Company’s retained 25% project equity. Mirasol will be the operator for the first 18 months, earning a scaled management fee of up to 10% of exploration expenditures. Indra is located at the intersection of the Paleocene age volcanic arc with the NW-SE oriented Culampaja structural corridor. The Culampaja is considered an important crustal-scale, trans-orogen structure that has influenced the emplacement of many large sized, precious metal and copper deposits in northern Chile and Argentina, including Gold Field’s recently discovered Salares Norte gold deposit (3.7 Moz Au), located where the structure traverses the Mio–Pliocene age mineral belt, 82 km to the SE of Indra. The Chilean Government published a regional geological map of the area including Indra which confirms the presence of a prospective Paleocene age rhyolitic flow domes and volcanic complex. The flow domes have been radiometrically dated at 56.2 Ma. Rhyolite flow domes of a similar age are also known to be associated with adjacent El Guanaco Gold mine and Yamana’s El Penon gold-silver mine  located 84 km to the north of Indra. This association suggests a prospective age for the flow domes and associated alteration system at the project. 2) Indra, with a carbonate-silica vein and vein-breccia zone. The Indra vein-breccia outcrops intermittently through thin unconsolidated post-mineral gravels, and has been mapped for a strike length of more than 7 km before it trends under thicker cover. The vein-breccias widths range from a few cm up to >10 m and are characterized by well-developed colloform and crustiform textures and brecciation, which are indicative of a high-energy multi-pulse hydrothermal system. Rock chip sampling of the Indra vein-breccia and the alteration and veining at Agni has returned low-level anomalous gold and silver (max 140 Au ppb and 1,690 Ag ppb) combined with very high levels of arsenic, antimony, mercury, and barium epithermal pathfinder elements, as well as strongly anomalous copper, lead and zinc. Alteration mineralogy analysis of the wall rocks hosting the vein-breccias at Indra show an interlayered illite and smectite mineral assemblage. The ratio of these minerals in the alteration can be used to estimate the approximate depth to the potentially underlying precious metal interval. 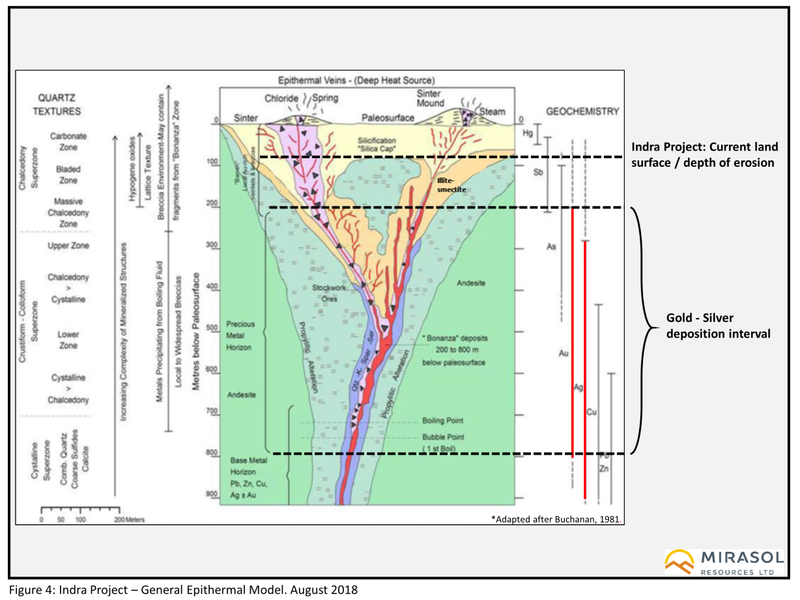 Based on Mirasol’s knowledge of this deposit class and ore deposit models developed from studies of epithermal deposits in Chile and other parts of the world, Indra is interpreted as representing the upper levels of a large epithermal system, where the high-grade gold-silver mineralization may be preserved at depth beneath the outcropping Indra and Agni alteration and vein zones. 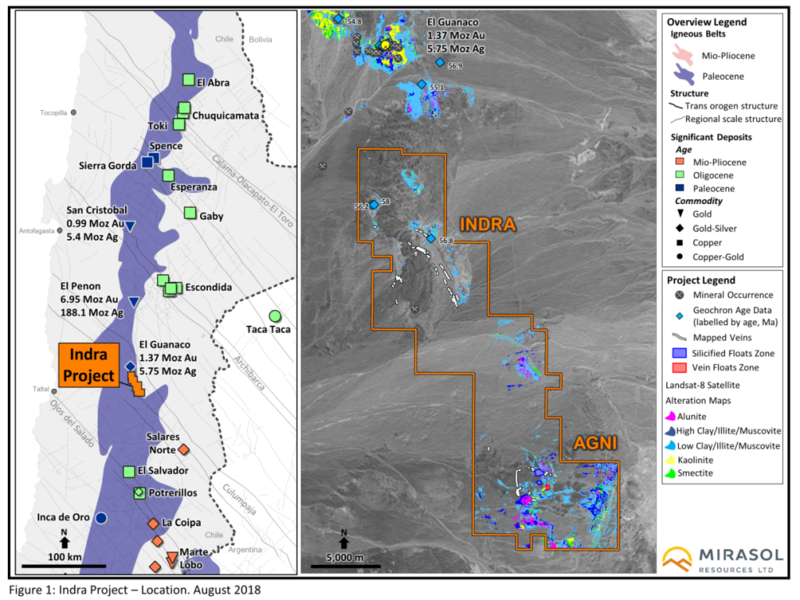 This interpretation is supported by the presence of “Indra” like carbonate – silica veining, peripheral to and overlying gold - silver mineralization in the El Penon district , and overlying the ore zone in the HOC Arcata gold-silver mine in Peru that has produced in-excess of 200 Moz Ag and 390K Moz Au. 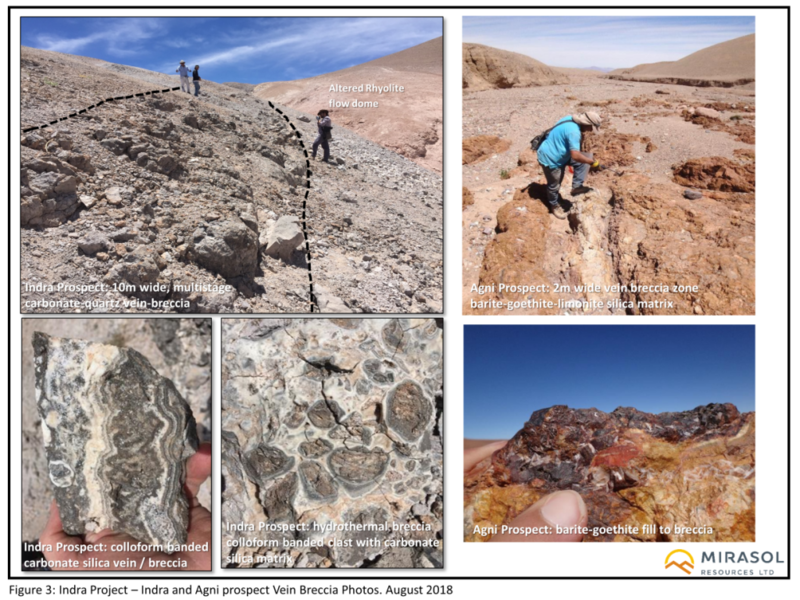 To learn more about past and recent results and the exploration potential at Indra, see all Current and Historical News Releases. Gold Fields. (2017). The Gold Fields Mineral Resource and Mineral Reserves Supplement to the Integrated Annual Report 2017. Warren, I. et. al. (2008). Geochronology of epithermal Au-Ag mineralization, magmatic-hydrothermal alteration, and supergene weathering in the El Penon district, northern Chile. Economic Geology, 103(4), 851-864. Bissig, T. et. al. (2007). Vein carbonates in the low sulfidation epithermal Au-Ag District of El Penon, II Region, Chile: environment of formation and exploration implications. Revista geológica de Chile, 34(2), 291-303. Candiotti de los Rios, H. et. al. (1990). Geologic setting and epithermal silver veins of the Arcata district, southern Peru. Economic Geology, 85(7), 1473-1490. and Hochschild Mining public prospectus and production reports.